I have read books of the author before and was excited to read the change in the genre of writing. Loved the previous genre and the style of writing as well. Aditya Kapoor, a bestselling author, a successful banker balanced with a The book is fast paced and does not have too many characters unlike the author’s previous books. and loving wife Maya, blessed with son Aryan who adores their parents. Shreya Kaushik, a student in IIM Banglore, young, beautiful and an aspiring writer, who wants to be a bestseller. She is intelligent but reckless . Girl with a troubled past. The book begins with Aditya Kapoor, the protagonist, the successful author, addressing the crowd in IIM Bangalore of whose he is an alumunus. They cross each others path here and get into an argument. It was new for Aditya, but he maintains his cool and on the other hand Shreya ‘s behaviour irkes the college chairman. To not miss an opportunity to win a prestigious award for which Shreya was being considered, she starts reading Aditya ‘s books although she isn’t a fan of Indian authors. Her verdict of Aditya’s books was- unputdownable. Aditya had a convert and a new fan. Subsequently the events turn out to be favourable to Shreya, she wins the Chairman’s award and is also selected into the same bank as Aditya. Aditya although has a loving wife is swayed and Shreya wants a bestseller to make her a bestseller. The story takes few expected twists and few unexpected turns. 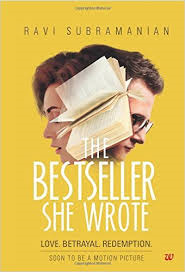 The author expresses his opinions on books, writing and it’s marketing via Aditya and the character Shreya portrays how sometimes the would be authors are. The novel deals about Ebola and the sacrifices Maya does to strike the balance between Aditya ‘s profession and personal life. Then there are other characters who play important roles too, Aditya’s best friend Sanjay, who has helped Aditya with his current job and in section of Shreya into the bank. Shreya’s best friend Sunaina, who always try to put sense into her when required. Shreya is desperate and wants her dream to come true, the usually bossy Aditya is submissive to her. Like the author says, Love, betrayal and redemption,what would be the consequences and effects on Aditya’s life when Maya knows about Shreya and him. The turmoil that would be created in everyone’s life would be tremendous. The mistake grave, the planning and plot deep and the after math disastrous. 1. The book has reference to real life author’s and persons making the effect of reading very pleasant. 2. The new genre, the attempt very beautiful. 3. A treat for all the would be authors. 1. The character Shreya’s background and past was not dealt much. 2. Few things we’re wrapped quickly and abruptly. The book is fast paced and does not have too many characters unlike the author’s previous books. Overall, the book is a good read and attempt fabulous. A great book to read over the weekend.